If you haven't heard of Fancy Nancy by now you must either live under a rock, or you don't have a little girl in your house. The children's book character, Fancy Nancy, loves to turn the ordinary into extraordinary. 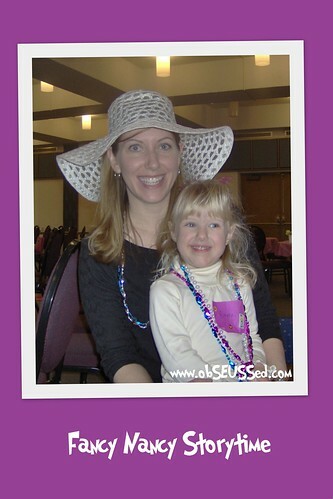 Here we are at our local library storytime Fancy Nancy Party. They made fancy masks, gave everyone a bling necklace, had fancy cookies and lemonade in tea cups, had the girls do a fashion walk down a red carpet and dance to fancy music on the stage. Make sure to add glitter and bling to your holiday decorations and festivities this season just like Fancy Nancy's Splendiferous Christmas. 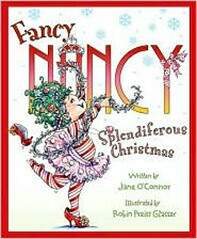 Nancy says splendiferous is the only word that "describes how magnificent, joyous and sparkly Christmas morning is." She wants Christmas to be fancy with a special tree topper but when things go wrong her grandpa teaches her how to "make eggnog out of broken eggs." The Fancy Nancy book series by Jane O'Conner, illustrated by Robin Glasser, helps introduce new 'fancy' vocabulary to young readers. My 7 yr old and I have loved this series for 4 years. The original hard backs are a little hard for her to read because the font is too fancy but all the easy reader books have been perfect for her. The Fancy Nancy collection seems to be growing every month with new books popping up every time I go to the store. We are adding Fancy Nancy and the Fabulous Fashion Boutique, The Delectable Cupcake and My Family History to our home library this Christmas. We bought the cupcake one from our school book fair the fashion boutique from Amazon online after Thanksgiving and the Family History one from our local Barnes and Nobel. I've also seen them in our Scholastic book order, at Target and Wal-mart - I told you they are everywhere. I'm so excited for the family history one because our family does a lot of research and it introduces some great vocab for young readers, like 'ancestors'. I am also excited for 'The Delectable Cupcake' as I am crazy about cupcakes, see the Cupcake Conference. Wishing you a Spendiferous Christmas! 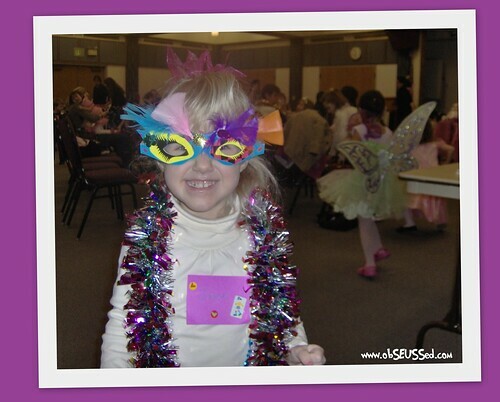 Here are some more Fancy Nancy items you can click on for more details. Hi Victoria, I was just re-reading some old posts and saw your comment on my circle skirt. It was left a long time ago! I thought I'd drop by. I love your blog and I really love Jan Brett's "The Mitten". My five kids ADORED this book when they were little! I'm glad you mentioned it as I now have five grandchildren (in the last four years) and this would make a great birthday gift this year.